Pentax Collecting is just starting to come into its own. Like most collectibles, the earlier the better. 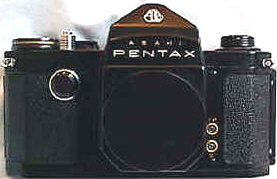 In 1957 Asahi introduced their newest SLR, the "Pentax." It was Asahi's first camera with a built in Pentaprism and only the second pentaprism Japanese SLR ever -- after the Miranda Orion. Pentax expert Fred Sherfy estimates in his book "Asahiflex and the Pre-1959 Asahi Pentax Cameras" about 19,600 Pentax Originals were produced -- or a production a few thousand less than the rare and highly sought after Nikon SP. Shutter speeds from 1 to 1/500th, with a rotating high speed dial from 1/500th to 1/50th and a separate low speed dial from 1/25 to 1 second. Far right top mounted lever advance. This was actually a first in 35 SLR design. 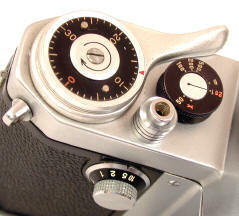 Previous cameras had used knob advances, while the Exakta had long used a left handed advance lever. 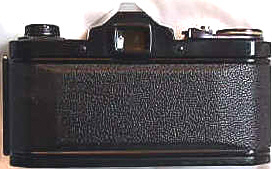 The film advance and shutter release are very smooth, helping to start the Pentax reputation for high precision and quality workmanship. The film counter on the advance lever was manually set, the photog had to set it to one each roll, or not know where there were on the roll. Separate high and low shutter speed dials (1/500 - 1/50 plus B and X, and 1/25th to 1, plus T). Setting the high speeds requires lifting up the dial and rotating it to align with the center post. The high speed dial rotates during all exposures, even the slow speeds, so those with big fingers can get uneven exposures by touching the high speed dial during exposures. 42mm thread mount which later became known as the Pentax or universal screw mount. It wasn't really the Pentax mount though, since the 42mm screw mount was introduced on the East German Contax S in 1949. 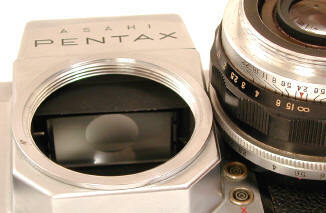 An adapter allowed the use of Asahiflex screw mount lenses on the Pentax' larger screw mount. The underneath of the focusing screen shows the large ground glass center spot surrounded by visible fresnell rings. Separate X and M sync terminals are visible in the lower right of the pic. Easy film loading with hinged back, lift up latch on end of back door. Pre-set diaphragm: Notice TWO aperture rings on the 58/2.4 Takumar lens. The click stopped outer ring is used to pre-set the shooting aperture. The knurled, easily turning inner aperture ring quickly stops down the lens just before shooting, and opens the lens back up again to full aperture for bright viewing. That's right, the photog had to manually open and close the lens. The original normal lenses were the 58/2.4, 58/2, and 55/2.2 Takumars, all pre-set. In my experience at least, most of these original lenses were replaced with later Takumars, so the pre-set original lenses are hard to find. Far left top mounted lever rewind. A first in 35 SLR design. 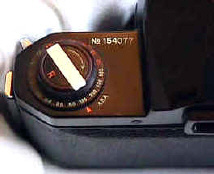 Previous 35 SLRs had knob rewinds. Interestingly, the original Pentax used a ASA reminder dial around the rewind lever--even though there was no built in meter. This later became standard once meters were built in. The original Pentax established a new high mark of Asahi craftsmanship, recognizable by the fine fit and finish and the smooth film advance. The original Pentax established a tradition of offering a very well made camera for a medium price. "Pentax" by way of Germany. 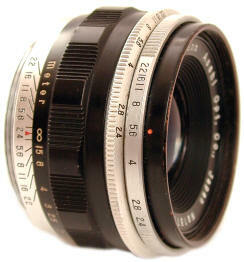 Many people call 42mm screw mount lenses "Pentax Screw Mount" due to Pentax popularizing the 42mm screw mount. 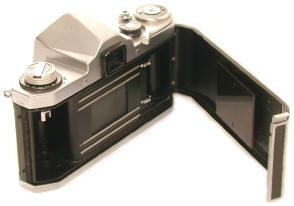 However, the first camera to use it was the East German Zeiss Contax S in 1949. Some believe the camera was designed before WWII interrupted production. Even the Pentax name was originally German. 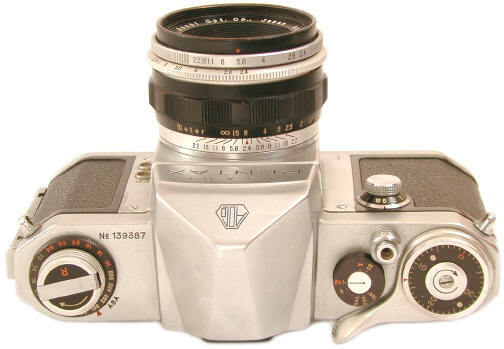 According to a book by Alexander Schultz called "Contax S, A History of the World's first 35mm Prism SLR Camera, Asahi bought the trademarked "Pentax" name from the East German camera manufacturer VEB Zeiss Ikon in Dresden about 1954. Looking backwards, it was not one of VEB's best decisions. 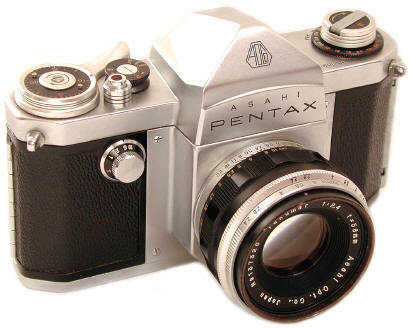 Apparently Pentax originally derived from PENTaprism and contAX, before the East Germans lost the court battle with West German Zeiss to use the Contax name world wide. The Black Pentax Original, the rarest Pentax ? 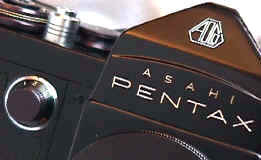 The "AOCO" logo on the pentaprism stands for "Asahi Optical Co."
Fred Sherfy emailed me that he has only encountered about SIX black Pentax Originals in all of his years of collecting! Today any original Pentax is hard to find, but the black ones are especially rare. 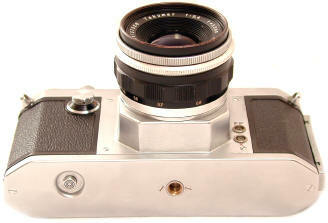 The Original Pentax is one of a handful of truly classic 35 SLR designs. For its time, one of the best designs ever.